D. N. Page, “The Height of a Giraffe”, in Foundations of Physics, forthcoming. A minor modification of the arguments of Press and Lightman leads to an estimate of the height of the tallest running, breathing organism on a habitable planet as the Bohr radius multiplied by the three-tenths power of the ratio of the electrical to gravitational forces between two protons (rather than the one-quarter power that Press got for the largest animal that would not break in falling over, after making an assumption of unreasonable brittleness). My new estimate gives a height of about 3.6 meters rather than Press’s original estimate of about 2.6 cm. It also implies that the number of atoms in the tallest runner is very roughly of the order of the nine-tenths power of the ratio of the electrical to gravitational forces between two protons, which is about . 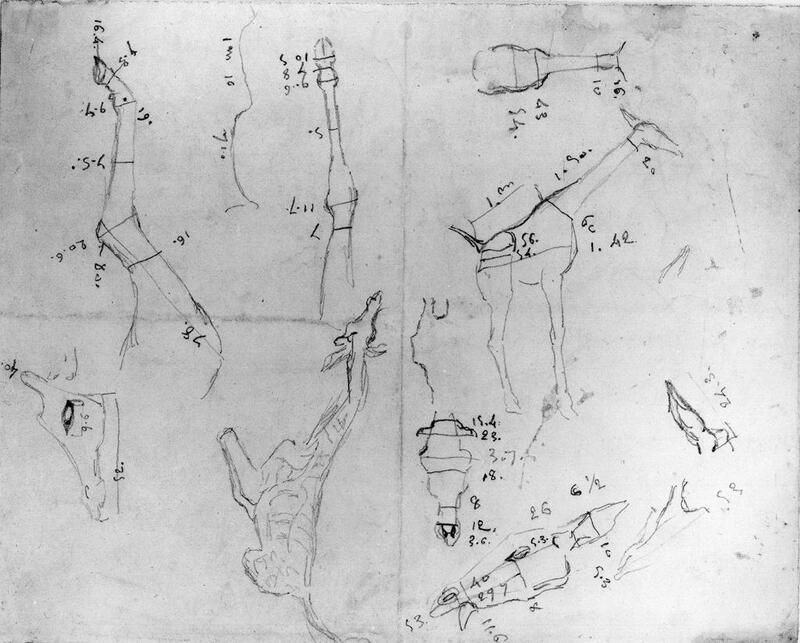 Antoine Louis Barye, Measured Drawing of Giraffe.